We love pesto around here…. and pasta…. and pesto pasta. While I made this as a vegetarian dish last night, I definitely think vegan substitutions would work well. I have seen tofu stuffed pastas at Whole Foods and coconut creamer is a great alternative to half & half. As for the parmesan though, since the vegan versions are more of a sprinkle variety, begin with just 1/2 cup and then add more if necessary. In a large skillet, melt butter over medium heat. Add garlic and sauté for 1-2 minutes. Whisk in the creamer and bring to a boil, stirring frequently. Reduce heat to low and mix in the Parmesan cheese. When the cheese has melted in to the sauce, stir in the pesto and allow to simmer 3-5 minutes. Season to taste with salt and pepper. 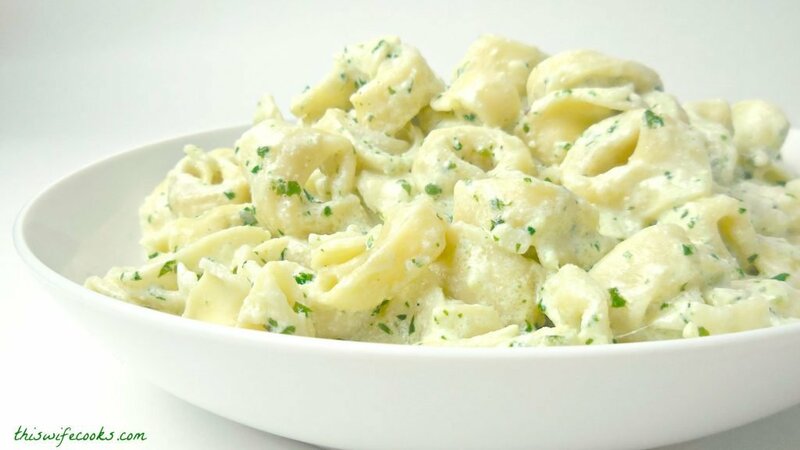 Fold in the tortellini and serve warm.